This is “Why Outline?”, section 12.1 from the book Public Speaking: Practice and Ethics (v. 1.0). For details on it (including licensing), click here. Outlines help maintain the speech’s focus on the thesis by allowing the speaker to test the scope of content, assess logical relationships between ideas, and evaluate the relevance of supporting ideas. Outlines help organize a message that the audience can understand by visually showing the balance and proportion of a speech. Outlines can help you deliver clear meanings by serving as the foundation for speaking notes you will use during your presentation. In order for your speech to be as effective as possible, it needs to be organized into logical patterns. Information will need to be presented in a way your audience can understand. This is especially true if you already know a great deal about your topic. You will need to take careful steps to include pertinent information your audience might not know and to explain relationships that might not be evident to them. Using a standard outline format, you can make decisions about your main points, the specific information you will use to support those points, and the language you will use. Without an outline, your message is liable to lose logical integrityA characteristic of reasoning in which each claim is carefully supported by an orderly sequence of the right kind of evidence and by the right amount of evidence.. It might even deteriorate into a list of bullet points with no apparent connection to each other except the topic, leaving your audience relieved when your speech is finally over. A full-sentence outline lays a strong foundation for your message. It will call on you to have one clear and specific purposeA concrete, narrow purpose. For instance, a general purpose might be to inform the audience about airport security in general. The specific purpose might be to explain the specific reasons for the watch list. for your message. As we have seen in other chapters of this book, writing your specific purpose in clear language serves you well. It helps you frame a clear, concrete thesis statement. It helps you exclude irrelevant information. It helps you focus only on information that directly bears on your thesis. It reduces the amount of research you must do. It suggests what kind of supporting evidence is needed, so less effort is expended in trying to figure out what to do next. It helps both you and your audience remember the central message of your speech. Finally, a solid full-sentence outline helps your audience understand your message because they will be able to follow your reasoning. Remember that live audiences for oral communications lack the ability to “rewind” your message to figure out what you said, so it is critically important to help the audience follow your reasoning as it reaches their ears. Your authors have noted among their past and present students a reluctance to write full-sentence outlines. It’s a task too often perceived as busywork, unnecessary, time consuming, and restricted. On one hand, we understand that reluctance. But on the other hand, we find that students who carefully write a full-sentence outline show a stronger tendency to give powerful presentations of excellent messages. When you begin with a clear, concrete thesis statement, it acts as kind of a compass for your outline. Each of the main points should directly explicateTo provide a detailed explanation. the thesis statementA short, declarative sentence that states the purpose, intent, or main idea.. The test of the scope will be a comparison of each main point to the thesis statement. If you find a poor match, you will know you’ve wandered outside the scope of the thesis. Let’s say the general purpose of your speech is to inform, and your broad topic area is wind-generated energy. Now you must narrow this to a specific purpose. You have many choices, but let’s say your specific purpose is to inform a group of property owners about the economics of wind farms where electrical energy is generated. Your first main point could be that modern windmills require a very small land base, making the cost of real estate low. This is directly related to economics. All you need is information to support your claimA statement that warrants the support of facts from authoritative sources. that only a small land base is needed. In your second main point, you might be tempted to claim that windmills don’t pollute in the ways other sources do. However, you will quickly note that this claim is unrelated to the thesis. You must resist the temptation to add it. Perhaps in another speech, your thesis will address environmental impact, but in this speech, you must stay within the economic scope. Perhaps you will say that once windmills are in place, they require virtually no maintenance. This claim is related to the thesis. Now all you need is supporting information to support this second claim. Your third point, the point some audience members will want to hear, is the cost for generating electrical energy with windmills compared with other sources. This is clearly within the scope of energy economics. You should have no difficulty finding authoritative sourcesSources that use factually verifiable observations and data to provide rigorous conclusions that will not collapse under scrutiny. of information to support that claim. When you write in outline form, it is much easier to test the scope of your content because you can visually locate specific information very easily and then check it against your thesis statement. You have many choices for your topic, and therefore, there are many ways your content can be logically organized. In the example above, we simply listed three main points that were important economic considerations about wind farms. Often the main points of a speech can be arranged into a logical pattern; let’s take a look at some such patterns. A chronological pattern arranges main ideas in the order events occur. In some instances, reverse order might make sense. For instance, if your topic is archaeology, you might use the reverse order, describing the newest artifacts first. A cause-and-effect pattern calls on you to describe a specific situation and explain what the effect is. However, most effects have more than one cause. Even dental cavities have multiple causes: genetics, poor nutrition, teeth too tightly spaced, sugar, ineffective brushing, and so on. If you choose a cause-and-effect pattern, make sure you have enough reliable support to do the topic justice. A biographical pattern is usually chronological. In describing the events of an individual’s life, you will want to choose the three most significant events. Otherwise, the speech will end up as a very lengthy and often pointless time line or bullet point list. For example, Mark Twain had several clear phases in his life. They include his life as a Mississippi riverboat captain, his success as a world-renowned writer and speaker, and his family life. A simple time line would present great difficulty in highlighting the relationships between important events. An outline, however, would help you emphasize the key events that contributed to Mark Twain’s extraordinary life. Although a comparison-contrast pattern appears to dictate just two main points, McCroskey, Wrench, and Richmond explain how a comparison-and-contrast can be structured as a speech with three main points. They say that “you can easily create a third point by giving basic information about what is being compared and what is being contrasted. For example, if you are giving a speech about two different medications, you could start by discussing what the medications’ basic purposes are. Then you could talk about the similarities, and then the differences, between the two medications.”McCroskey, J. C., Wrench, J. S., & Richmond, V. P., (2003). Principles of public speaking. Indianapolis, IN: The College Network. Whatever logical pattern you use, if you examine your thesis statement and then look at the three main points in your outline, you should easily be able to see the logical way in which they relate. When you create an outline, you can clearly see that you need supporting evidenceInformation from an expert source, which is relevant to a main point. for each of your main points. For instance, using the example above, your first main point claims that less land is needed for windmills than for other utilities. Your supporting evidence should be about the amount of acreage required for a windmill and the amount of acreage required for other energy generation sites, such as nuclear power plants or hydroelectric generators. Your sources should come from experts in economics, economic development, or engineering. The evidence might even be expert opinion but not the opinions of ordinary people. The expert opinion will provide stronger support for your point. Similarly, your second point claims that once a wind turbine is in place, there is virtually no maintenance cost. Your supporting evidence should show how much annual maintenance for a windmill costs and what the costs are for other energy plants. If you used a comparison with nuclear plants to support your first main point, you should do so again for the sake of consistency. It becomes very clear, then, that the third main point about the amount of electricity and its profitability needs authoritative references to compare it to the profit from energy generated at a nuclear power plant. In this third main point, you should make use of just a few well-selected statistics from authoritative sources to show the effectiveness of wind farms compared to the other energy sources you’ve cited. Where do you find the kind of information you would need to support these main points? A reference librarian can quickly guide you to authoritative statistics manuals and help you make use of them. An important step you will notice is that the full-sentence outline includes its authoritative sources within the text. This is a major departure from the way you’ve learned to write a research paper. In the research paper, you can add that information to the end of a sentence, leaving the reader to turn to the last page for a fuller citation. In a speech, however, your listeners can’t do that. From the beginning of the supporting point, you need to fully cite your source so your audience can assess its importance. Because this is such a profound change from the academic habits that you’re probably used to, you will have to make a concerted effort to overcome the habits of the past and provide the information your listeners need when they need it. Part of the value of writing a full-sentence outline is the visual space you use for each of your main points. Is each main point of approximately the same importance? Does each main point have the same number of supporting points? If you find that one of your main points has eight supporting points while the others only have three each, you have two choices: either choose the best three from the eight supporting points or strengthen the authoritative support for your other two main points. Remember that you should use the best supporting evidence you can find even if it means investing more time in your search for knowledge. Although we recommend writing a full-sentence outline during the speech preparation phase, you should also create a shortened outline that you can use as notes allowing for a strong delivery. If you were to use the full-sentence outline when delivering your speech, you would do a great deal of reading, which would limit your ability to give eye contact and use gestures, hurting your connection with your audience. For this reason, we recommend writing a short-phrase outline on 4 × 6 notecards to use when you deliver your speech. The good news is that your three main points suggest how you should prepare your notecards. Your first 4 × 6 notecard can contain your thesis statement and other key words and phrases that will help you present your introduction. Your second card can contain your first main point, together with key words and phrases to act as a map to follow as you present. If your first main point has an exact quotation you plan to present, you can include that on your card. Your third notecard should be related to your second main point, your fourth card should be about your third main point, and your fifth card should be related to your conclusion. In this way, your five notecards follow the very same organizational pattern as your full outline. 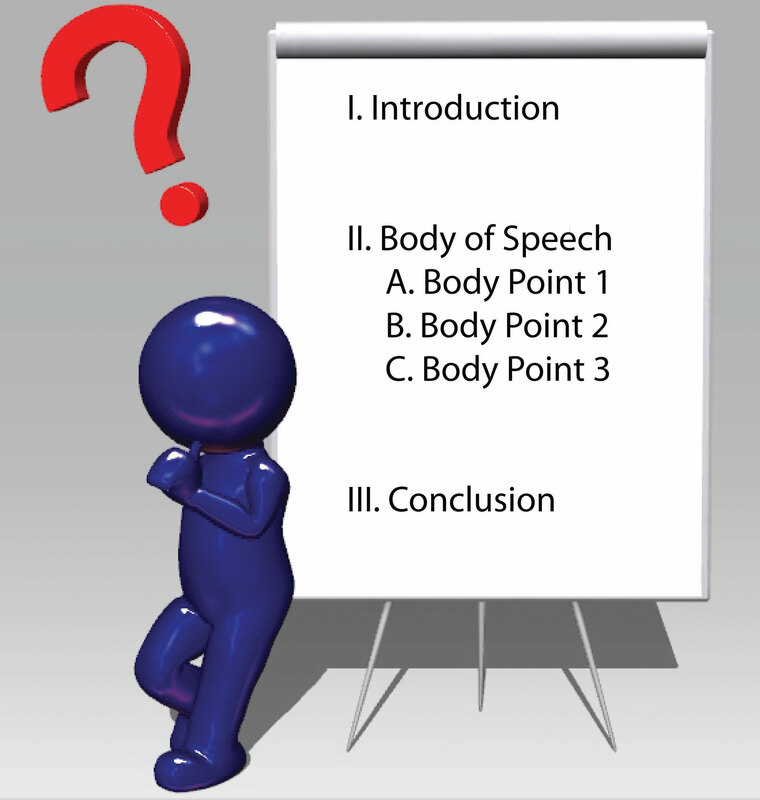 In the next section, we will explore more fully how to create a speaking outline. Your outline can help you stay focused on the thesis of your presentation as you prepare your presentation by testing the scope of your content, examining logical relationships between topics, and checking the relevance of supporting ideas. Your outline can help you organize your message by making sure that all of your main points are well developed. Your outline can help you stay focused during your presentation by forming the foundation for your speaking outline, which lets you connect to your audience and be clear in the message you’re presenting. In one sentence, write a clear, compelling thesis statement about each of the following topics: the effects of schoolyard bullying, the impact of alcohol on brain development, and the impact of the most recent volcano eruption in Iceland. Fully cite the sources where you verify that your thesis statements are actually true. Prepare a full-sentence outline for your next speech assignment. Trade outlines with a classmate and check through the outline for logical sequence of ideas, presence of credible support, proper citation, and clear organization. Give feedback to your partner on areas where he or she has done well and where the outline might be improved. Transfer information from your speech outline to notecards using the guidelines described above. Practice delivering your speech for a small audience (e.g., family member, group of friends or classmates) using first the outline and then the notecards. Ask the audience for feedback comparing your delivery using the two formats.